A collection of over 100 powerhouse recipes for fresh juices and smoothies, blended from fruit and vegetables and packed with added super-nutrients. Whether you’re looking for a punchy pick-me-up, an effective detoxifier, or an anti-aging rejuvenator, Superfood Juices & Smoothies shows how to make flavor-packed drinks with unbeatable therapeutic properties. Along with the nutrients gleaned from "superfood" fresh fruit and vegetables, these great-tasting glassfuls contain the added benefit of active super-nutrients such as spirulina, wheatgrass, maca, baobab, açaí berries, chia seeds, and raw cacao among others. The first chapter, Detoxifiers, includes delicious recipes such as the Minty Fresh, designed to flush out the digestive system and encourage the elimination of toxins, and the Clear Mind packed with blueberries to boost concentration and memory. Energy-Enhancers features uplifting drinks such as the Super Boost, Rocket Fuel, and Raspberry and Goji Restorer. If you’re feeling under the weather, try a warm, spicy and restorative Cold Comfort from the collection of Pick-me-ups. Alongside over 100 recipes there are also tips for getting the most from your fresh produce. For those who want to start from scratch, there are also recipes for making your own yogurt and dairy-free nut milks, as well as sprouting seeds and beans at home so you can be confident that your drink is 100% home-produced as well as tasting delicious! 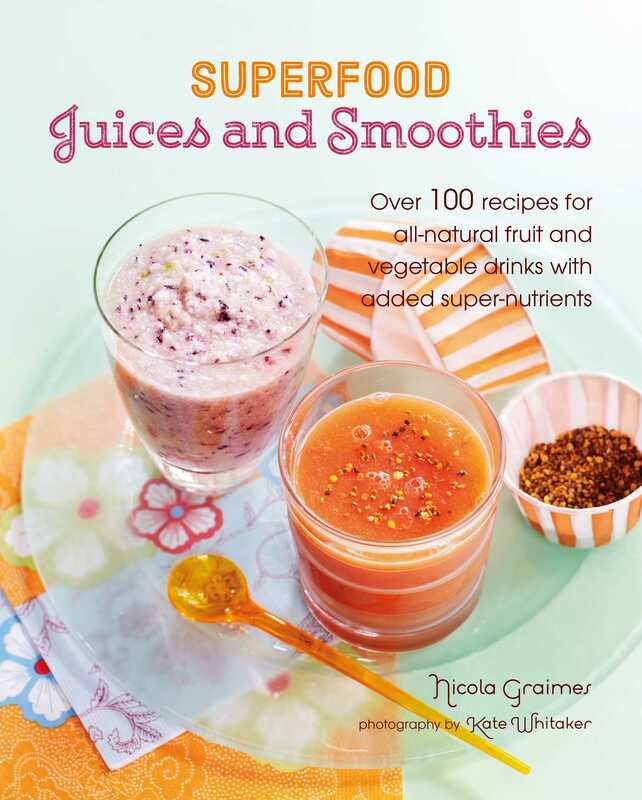 Nicola Graimes is an award-winning writer specializing in nutritional health, vegetarian cooking and food for children. A former editor of Vegetarian Living magazine, she has written 26 books, including 'Great Healthy Food for Vegetarian Kids', which won Best Vegetarian Cookbook in the World Gourmand Awards 2010. For Ryland Peters & Small she has written 'The Salad Bowl' (978-1-84975-601-3). Nicola lives in Brighton.